Want to add some green to your yard? Try our hydroseeding in Tacoma! Yards with a well-kept lawn full of grass look great. They give off an immediate first impression of someone who takes the time to care about themselves and their surroundings. This is especially important in a business setting, as many people associate this image with the business practices. If one business has a pristine, cleaned-up business front and the neighboring competitor’s is dirty and unkempt, most will go with the one that looks nicer. Adding grass is a great way to make a significant change, but traditional methods are expensive or take a lot of time to see the benefits. 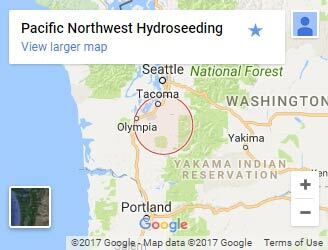 If you have a business that could use some sprucing up, try hydroseeding in Tacoma by Pacific Northwest Hydroseeding. You’ll be amazed at the difference it will make! Hydroseeding is the best way to achieve a lush green lawn. Developed in the ’50’s, hydroseeding combines seeds, mulch, and water into a mixture that is sprayed into parts of your lawn that need more grass coverage. At Pacific Northwest Hydroseeding, we know best how grass thrives in different climates. We know about the diseases or species of weeds that can cause grass to die off. That’s why we use a blend of five different seeds of fescue and turf for a vigorous and resilient lawn. A hydroseeder is fast and efficient. Our hydroseeder truck mixes all of the important components together into a single mixture. This includes the seeds, binding agents, and fertilizers to promote healthy growth. If erosion control is important at your property, the slurry creates a tighter, more compact soil that is resilient and won’t break apart easily. Other alternatives don’t measure up. Laying Sod: While laying sod down or re-sodding your lawn involves time, effort, and experience, homeowners also don’t get the seamless look and feel of naturally growing grass. Hand Seeding: Hand seeding takes more time for bare patches to sprout into naturally growing grass, and is susceptible to wind or water erosion. Don’t forget to water the lawn regularly after the hydroseeding application! It’s critical that you water the area liberally after hydroseeding. But be careful not to overwater! The soil should be moist, but not muddy. We include a comprehensive guide for lawn care after hydroseeding to maximize the chance of your lawn growth being successful. We’ll take care of both you and your property. 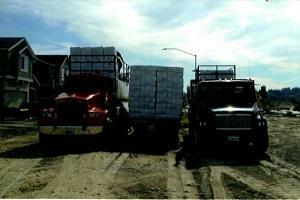 From the initial estimate to the finished product, you’re sure to be impressed by our professionalism and efficiency. Want an idea of how much hydroseeding will cost at your property? Call or contact us today for a FREE estimate!